What you use to substitute for eggs in a recipe depends on the recipe. Whether you are allergic to eggs, lowering your cholesterol, or trying to go vegan, replacing eggs in recipes requires some thought. The biggest lesson is learning which egg substitute works best in your particular recipe. Generally, the fewer eggs a recipe calls for, the easier they are to substitute. If a cookie recipe calls for one egg, using an egg substitute works better than if a recipe requires three or four eggs. Taste matters, too. Using bananas as an egg substitute may add a welcome hint of fruity sweetness to pancakes and cookies, but if you are making a casserole or savory dish, you want to use something else. In a cake, the eggs serve as a leavening agent to make the cake light and fluffy. In cookies and muffins, eggs add moisture and act as a binder, gluing all the other ingredients together. 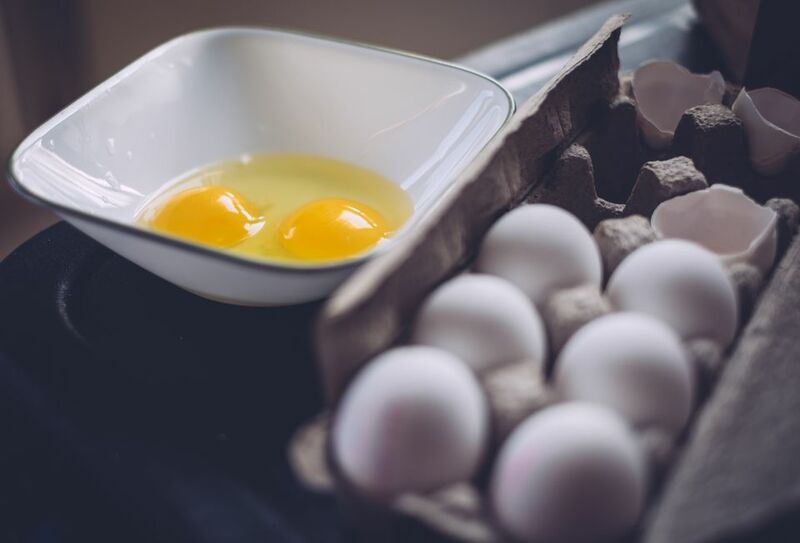 If you're looking to substitute eggs in a quiche or mayonnaise, where eggs are central to the finished product, you'll need something like tofu to mimic the consistency of the eggs, while making other adjustments to the recipe as well to add flavor and body. Just about any recipe that calls for eggs can be made vegan by using the proper commercial egg substitute. Several brands of egg replacers can be used in baking or whenever a recipe calls for egg replacer. Two trusted brands are the Ener-G brand and Bob's Red Mill, but there are others. Versatile and easy-to-use commercial egg replacers are available in most health food stores and large grocery stores. Store-bought egg substitutes are relatively flavorless and work best in baked goods, such as cookies, muffins, and cakes. They can also be used to bind ingredients in a vegan casserole or loaf. If you're looking for something to replace your morning scrambled eggs, try plant-based VeganEgg from Follow Your Heart for a scrambled egg substitute that can fool even the biggest lovers of greasy-spoon breakfasts. Smash up or blend about a half a banana or 1/4 cup applesauce to use as an egg replacer in baked goods such as muffins, pancakes, and yeast-free quick bread such as pumpkin bread and banana bread. Bananas and applesauce add the perfect amount of thick moisture like eggs, but they don't help your dishes rise or turn out light and fluffy, so be sure the recipe you are using includes a bit of baking powder or baking soda to help it rise if needed. Tofu is the best way to substitute eggs in dishes such as a quiche, frittata, or egg salad. The texture of silken tofu or crumbled regular tofu is surprisingly similar to boiled or cooked eggs when used in a recipe. The addition of a bit of mustard, turmeric, or nutritional yeast to the dish give it a yellow hue, so your eyes are tricked as well as your taste buds. Because other recipe adjustments are probably needed to make an egg-free frittata, it's best to follow a recipe rather than just replacing the eggs with tofu. Silken tofu is also an appropriate egg substitute in baked goods. To use it in recipes, blend 1/4 cup silken tofu with the liquid ingredients until the tofu is smooth and creamy. While it won't alter the flavor of a recipe, using tofu as an egg substitute makes baked goods a bit on the heavy and thick side, so it works well in brownies and pancakes, but doesn't work well in something like an angel food cake that needs to be light and fluffy. In a pinch—or with a good recipe—vinegar mixed with water can be an egg substitute, as can plain, run-of-the-mill club soda. For savory entrees such as a vegetarian casserole or a loaf, try using 2 to 3 tablespoons of breadcrumbs or oats to act as a binder.